A nearly 900-foot-wide asteroid that initially triggered fear it would hit Earth now has almost no chance of impacting the planet during three close encounters this century, NASA announced last week. The Apophis asteroid, also named 2004 MN4, now has a 1-in-250,000 chance of colliding with Earth during a projected near-miss on April 13, 2036. Those odds have been reduced from 1-in-45,000 in a recent round of orbit measurements largely based on unreleased imagery from the University of Hawaii's 88-inch telescope at Mauna Kea. 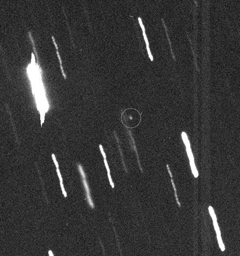 Near-Earth object scientists Steve Chesley and Paul Chodas of NASA's Jet Propulsion Laboratory spearheaded the analysis. A team of astronomers led by Dave Tholen at the University of Hawaii's Institute for Astronomy in Manoa made the observations, according to NASA. In the days following the announcement of the discovery of Apophis in 2004, astronomers made near-daily updates on the odds the asteroid would hit Earth on Friday, April 13, 2029. The odds of an impact briefly spiked to 2.7 percent, an unprecedented number that caught the attention of the public and caused Apophis to be assigned a No. 4 on the Torino Scale. That metric measures the probability of an asteroid or comet collision combined with the potential damage of an impact. "Apophis has been one of those celestial bodies that has captured the public's interest since it was discovered in 2004," said Chesley. Subsequent analysis eliminated any possibility of Apophis hitting Earth in 2029, but scientists could not do the same for another close approach in 2036. The asteroid's orbit dynamics are further clouded by some uncertainty on the effects of Earth's gravity on Apophis when it passes no closer than 18,300 miles from the planet in 2029, leaving astronomers unable to create more accurate estimates of the asteroid's trajectory in 2036. That distance will be the closest recorded flyby of an asteroid by Earth. Scientists estimate such encounters with asteroids the size of Apophis occur about once every 800 years. "The refined orbital determination further reinforces that Apophis is an asteroid we can look to as an opportunity for exciting science and not something that should be feared," said Don Yeomans, manager of the Near-Earth Object Program Office at JPL. The new analysis also yielded new information on the path of Apophis later this century, revealing another visit to Earth's vicinity in 2068. Odds for an impact then are less than 1-in-300,000, according to NASA.